Michael and I have been in Phoenix this week for the Waste Management Phoenix Open. We have been so fortunate to have lots of friends and family come out and support us during the tournament, even though it didn’t go as well as we would have liked. Michael has also been battling a cold/flu this week which has been difficult for him, but his health seems to be getting better having these extra days to rest. To be honest, missing the cut is probably the best gift that God could have given him with this illness. Please pray for him that his health may return to normal quickly...I hate seeing him suffer. Today we went to Impact Church in Scottsdale, AZ and heard Tim Tebow speak. It was so refreshing to hear him talk about using his status in the NFL as his platform for sharing the love of God. He shared a statistic that really opened my eyes; a recent poll showed that 2 out of 3 Americans say that professional athletes (and probably celebrities) are more influential than pastors (sorry he gave no reference). Not sure how accurate that is, but I can totally believe it. People WORSHIP their athletic idols. In every professional sport, fans have favorite players that they follow. We wear their jerseys, follow every game/match/round/competition they play in, and debate their accomplishments with friends and foes. Most people would much rather spend a Sunday, or any day for that matter, watching their favorite players and teams play than listening to a sermon. That is just the culture we live in. Now think about this...what if every single one of those athletes was a follower of Christ and was not scared or ashamed to share their faith in a interview, on their jersey, and in every public setting they are involved in. What kind of impact do you think that would have? When Tim Tebow puts a Bible verse on his eye black during a college or NFL game, when Ray Lewis who has over 500,000 followers on twitter tweets about letting God drive his life, when PGA Tour pros Webb Simpson and Ben Crane talk about giving all glory to God in an on camera interview after they win a PGA event, how many people are watching them and hearing that? I realize now that this is why God put me and Michael in this life situation. He has placed us in the unique position of being able to reach a lot of people with our words and actions, a position not many people are put in and one many people abuse by glorifying themselves and constantly seeking more and more fame and notoriety. God knows our hearts and wishes for us to use this position as OUR platform to share our faith. We are role models to so many people, kids and adults alike, and Michael and I are constantly trying to find ways to share our faith with our fans, friends, and family. And not just with words, but more than anything with our actions, because actions show what is truly in our hearts. You could give the most eloquent speech about your love for God and how much he is a part of your life, but if your actions don’t back up your words, your words mean NOTHING. People will see our faith in the way we handle success, but more importantly defeat. If we can be happy and grateful for what God has given us, trusting in his plan and promise of a good future even when things aren’t going our way on the golf course, that will resonate with people and they will question where our inner joy and peace come from. They come from our security in the Lord. Over and over again in the Bible (Hebrews 13:6, Psalm 56:3-4, Psalm 27:1, 1 Peter 3:13-14...look these up!!! ), God tells us not to be afraid to share our faith and face each day as followers of Christ and says that if your strength and hope is in the Lord, what can humans do to harm you? They can do all sorts of things to your body, but if you continue to do God’s will, sharing the Gospel with those you come in contact with, your reward will be an eternal life of bliss in Heaven and no human can take that away from you. Matthew 10:28 says “Do not be afraid of those who kill the body but cannot kill the soul. Rather, be afraid of the One who can destroy both soul and body in hell.” Michael and I will not be afraid to share our faith because we know God loves us and will take care of us, regardless of what the world thinks of us. Do not be ashamed to share with those around you what it means to give your life to God and be loved by him. This is the Gospel: That God loves us so much that he sat back and allowed his perfect and only son to be ridiculed and die a horrific death to save us from our sins. Even if it were only for one person, he would have let it happen and Jesus would have done it willingly. But Jesus did it for EVERYONE who chooses to believe and be loved by God. It doesn’t matter what you’ve done in the past, what your sins were. Honestly IT DOES NOT MATTER WHAT YOU’VE DONE IN THE PAST!! You could be the worst sinner in the world and think God won’t take you, but if you genuinely desire to follow God, he will completely forget your past sins and make you a new person. They are washed away and God completely forgives and forgets about all of them the moment you decide to believe in him and the sacrifice his son made for you. Whatever position or vocation God has placed you in, he has placed you there because he thinks you have a unique personality and gift that you can use to share his message with those around you. Don’t be afraid or ashamed to share God’s awesome love with your friends, family, co-workers, acquaintances or perfect strangers. The fact is, you have no idea what tomorrow brings and you may be the only one in that person’s life who will ever be in a position to share the gospel with them. Do you really want to run the risk of them never hearing it? Tell those people how God has worked in and changed your life, and don’t just tell them the Gospel, LIVE the Gospel. Live a life through action, thought, word, and deed that reflects Jesus. Strive to treat and love people the way Jesus loves them and you. You may not see the fruits of your labor in the conversion of people, but they will remember your message and someday God will touch their hearts. Besides, you don’t share the Gospel because you want to feel the gratification of seeing someone come to Christ. This has never been about you. You share it because you love God, and you want to live your life to serve him because of the sacrifice he made for your life. This world needs to re-learn how to love. We followers of Christ need to swallow our pride and be bold and always seek opportunities to teach those around us about God’s love. It’s not just professional athletes, or pastors, or celebrities or people in positions of authority. It starts in your own home with your kids, parents, siblings, and other family. It then extends out to your friends and co-workers, and then on to acquaintances and people you encounter doing everyday tasks. And if you are in a position to impact a lot of people you may never meet, like professional athletes, we have an even bigger obligation to share our faith as this culture’s role models. Use whatever place God has put you in and share the Gospel. I love the quote I heard at church a few weeks ago, “Don’t hate the person, hate the enemy who is working in that person.” This means that everyone you come in contact with deserves to be loved and hear the Gospel, even if things they are doing or have done with their lives are considered sinful. You must not judge, exclude people, or show favoritism when sharing the Gospel. Share it with EVERYONE and LOVE EVERYONE. You can love people without condoning sinfulness. And the unconditional love you show them may help them realize their own sinfulness, just like you and I have realized ours (no one in this entire world is without sin). Together, I am certain we can make a huge impact on this culture. I recently found a new favorite song about living your life for God and like Jesus. It is called “Live Like That” by Sidewalk Prophets. It is so powerful...if anyone knows how to put soundbytes in a blog, please let me know cause I really wish I could just let you listen to it. I really feel God’s presence through music, so if yall have any other song recommendations that you love, feel free to post them as comments for other readers to see and hear! See yall out on the road! God loves you and so do Michael and I! 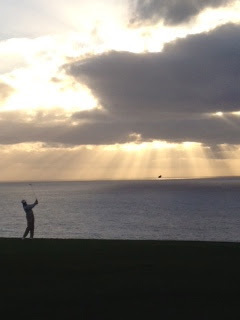 Michael on #4 at Torrey Pines with God reminding us he is always with us!